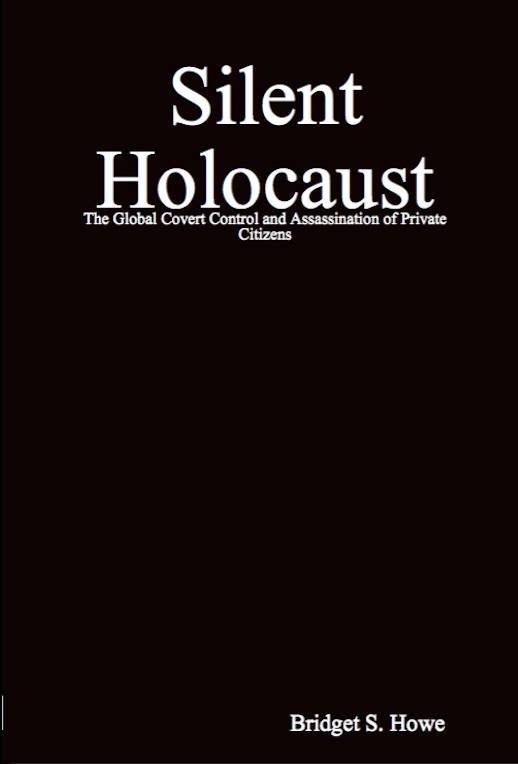 Silent Holocaust details the silent, global, covert, systematic destruction of private citizens. This silent war against innocent civilians is sponsored by the victims' respective governments via secret societies. The criminal justice systems is deliberately ignoring and denying this crime. In this country when we think of war we think of the sound of artillery, bombs being dropped and exploding, dead bodies in the streets and blood everywhere, blown out buildings and bomb shelters. That kind of war is ugly and noisy. But there is another kind of war going on in America that is silent but just as deadly. It is a covert war being waged against innocent civilians. It is not as easily perceived as a traditional war, therefore people don’t react with appropriate life sustaining measures. • Targeted Individuals are repeatedly attacked by electromagnetic weapons. These attacks include but are not limited to - electronic sexual assault - electronically induced migraines, diarrhea, muscle cramps, pain in the teeth and gums, and eye pain - forced sleep or sleep deprivation, dream manipulation - V2K or voice to skull transmission - electronic emotional manipulation such as induced anxiety, fear, panic, depression, rage etc. • A target’s home is repeatedly invaded while they are away or even while they sleep. Locks on the door do not kept stalkers out, and the stalker can bypass any security system. vandalism of vehicles and also theft of personal property. • Mail tampering and theft. • Computer hacking. Passwords and antivirus software have no effect at all at keeping stalkers out of the target’s personal accounts. • Poisoning of food and drink items left in the refrigerator. Poisoning of water supplies and even tampering with prescription medications. • Loss of employment or constant harassment on the job. Most targets are either unemployed or under employed. On the job, their work can and will be tampered with and their reputations discredited. This would include hacking and tampering with computer systems involved in the targeted individuals employment and belonging to the employer. • Targeted individuals are victims of gossip and slander. Their reputations can be destroyed and relationships and support networks dismantled. • Phones and all communication systems are monitored and interfered with. Communication with individuals who may attempt to help the targeted individual may be blocked and social networking severely hindered. • Targeted individuals are under constant surveillance. They have no privacy, and gangstalkers have no respect at all for the information they acquire while spying on their targets. Stalkers will use any piece of information or any action observed as a way to justify their actions against the target and continued abuse of the target. • Gangstalkers are often involved in witchcraft and practice astral projection. Targeted individuals also experience harassment from astral projecting spirits. They may physically attack the targeted individual, invisibly spy on the individual in their homes and steal from them. Targeted individuals frequently find personal items suddenly missing when they were present only moments before, and there was no one present (or visible) in the home who could have taken them. Those same items can mysteriously reappear. • Targeted individuals are often overcharged for services provided by local businesses and may be deceived by business owners as well. • Targeted individuals are frequently diagnosed with some kind of mental health problem particularly schizophrenia in order to discredit them and control them. They can be prescribed psychotropic medications that they don’t need in order to control them and manipulate them. Targeted individuals who complain of the harassment are frequently sent to the psych ward. These are the kinds of things that people leave communist countries to escape. America is no longer a democratic nation for the things that targeted individuals experience could not possibly occur in a nation where the law and constitutional rights are protected. In addition to that the actions taken against targeted individuals are covert and difficult to prove. Law enforcement is under obligation to support the crime, as well as attorneys, doctors, therapists etc. The targeted individual is absolutely without recourse.